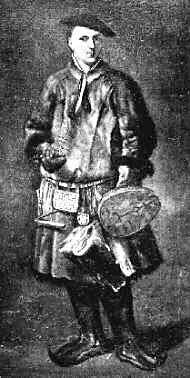 Linnaeus in his thirties wearing Sami attire from Lapland. The portrait was painted in Holland in 1737 by M. Hoffmann. His interest in Sami culture shows another aspect of Linnaeus’ curiosity. Linnaeus has been somewhat one-sidedly depicted as only being interested in plants. His work in botany is well known, and his sexual system is still studied in schools. It is less well known what an extraordinarily multifaceted scientist he was. All of nature was his research field, and all plants, animals, and minerals needed to be described and systematized. In the 18th century, what Linnaeus did was referred to by the collective name of natural history. Natural history comprised what we today would call botany, zoology, and mineralogy—that is, the sciences of plants, animals, and stones. So even though the main thrust of the Linnaean tradition consists of botanical research, there are many side branches, major and minor, that are worth knowing about. The Linnaean tradition has also taken new paths, coming to mean different things in different periods. This is a development that can be likened to a tree and its branches. There is a trunk, a few large boughs, and many small branches in different directions that all combine to make a lush crown. Botany: Read more at Linnaeus, plants, and animals. Zoology: It might be claimed that Linnaeus’ influence on zoology was greater than on botany. Read more at Linnaeus as a zoologist and Linnaeus as an ornithologist. Mineralogy: Linnaeus was also interested in stones and minerals. See Linnaeus as a mineralogist. Medicine: Linnaeus was a physician, which is often forgotten. In the 19th century he was a major source of inspiration to the remarkable physician and romantic Israel Hwasser. It was through him, for example, that Linnaeus came to be so influential in Swedish idealism. Read more at Linnaeus and pharmaceuticals – Unknown in Linnaeus’ day. Literature: Linnaeus’ writings, especially his travel diaries, came to have an important impact on literary developments in Sweden. This involves both what came to be considered worth describing and the way this was done. In other words, there is still today a living literary tradition that harks back to Linnaeus. Read more about Linnaeus’ language and Linnaeus in poetry – a journey through the history of ideas. View of nature: Linnaeus and the Linnaean tradition came to influence the view of nature in Sweden in many ways. The protection that plants and animals enjoy in Sweden and the love that many Swedes feel for nature are not self-evident. If you travel to southern Europe you will find an entirely different attitude, with animals and nature not being valued in the same way as in Sweden. Pursuing outdoor leisure activities to the extent we do is typically Swedish. Another way Linnaeus affected our view of nature was his work to raise the status of biology as a school subject. See more at Linnaeus’ view of nature and Faith in the Bible and Creation. Broberg, Gunnar ed., Linnaeus: Progress and Prospects in Linnean research (1980). Brusewitz, Gunnar, Carl von Linné: En introduktion till skrifterna (Gidlunds, 1987). Dal, Björn, Sveriges zoologiska litteratur: En berättande översikt om svenska zoologer och deras tryckta verk (Kjuge, 1996). Eriksson, Gunnar, Botanikens historia i Sverige intill år 1800 (Stockholm, 1969). Frängsmyr, Tore ed., Linnaeus: The Man and His Work (Canton, 1994). Hagberg, Knut, "Den linneanska traditionen", Svenska Linnésällskapets Årsskrift 1941.